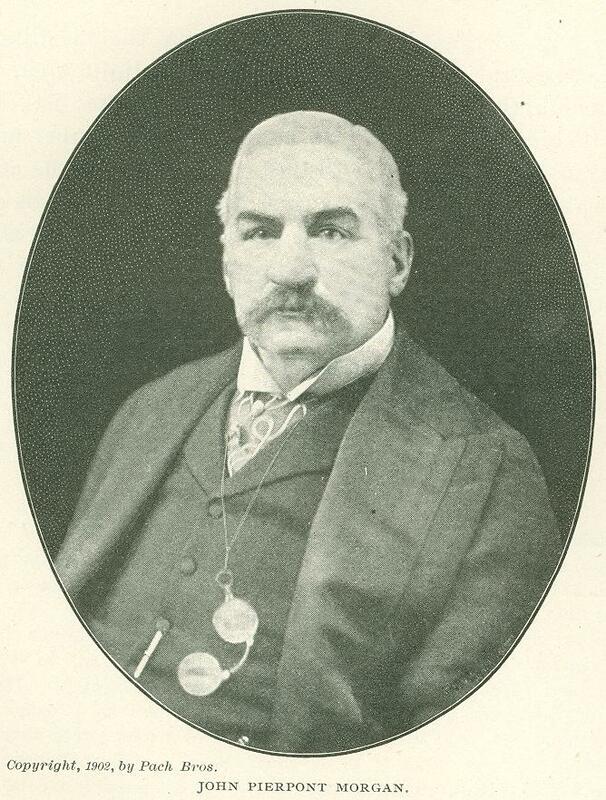 It is impossible to write anything really new (if true) about Mr. J. Pierpont Morgan. He has held the center of the financial stage so long that everything there is to say. about him has already been said. But there always remain different ways of say­ing old things, and perhaps I can present a pen-picture of the great financier which will convey to many who read it some new notion of the man. The most powerful private citizen in the world today, so far as financial affairs are concerned, is undoubtedly Mr. Morgan. There are richer men. There are men who can come nearer commanding great govern­ments. There are men in possession of opportunities and facilities as great as his. But no man outside of government circles has so much power today in the business world as he. How is this fact to be ex­plained? Mr. Morgan was born to the purple. He did not split rails or walk the tow­path or survey the forests primeval. He did not begin as the Astor, Vanderbilt or Gould founders began. He put down his school books and stepped into the great banking business built up by his father and his father's associates. He could have stepped in there as a hanger-on, a dainty putterer or a mere profit sharer. He could have been a rich loafer with no ambition but to eat all possible meals, drink all pos­sible drinks and fool with all possible fol­lies. He appears to have preferred to be just as good a man as if he had begun without a dollar. This feat is often per­formed in America, and no man ever per­formed it more successfully than he. He could have been a pigmy, but he chose to be a giant. Of course he could not be a giant merely by choosing to be. The capacity for gianthood had to be there. It was there, and, making the right choice, he became a giant. He can come nearer unsettling the great markets of the world today than any other unofficial person. He is as little likely to unsettle them as any man in the world. One reason why he has this power to unsettle is the certainty that he will not use it - the certainty that he does not believe in using it. He is con­structive, not destructive. He believes in building up, not in tearing down. He has never been a wrecker. His forte is bringing peace out of war, order out of chaos. His greatest achievements have all been distinctly of this charac­ter. What is now the Southern Railway was, a few years ago, an inco­herent flock of half-run railroads, yielding chiefly ruin to their own­ers and dis­comfort and dissatisfac­tion to their patrons. Hundreds of other in­stances could be named where a like transforma­tion has been worked. Every year that he continues to be what he now is will see, as the result of his work, rejuve­nated business enterprises and revised and reformed business methods, for which all the business world will be better. The characteristics which seem to enable Mr. Morgan to do what he does are some­what difficult to describe. If they could be easily discovered and exploited they would be adopted by the thousands who are eager and anxious to subdivide his suc­cess. Superficially observed, he is as arbi­trary and tyrannical as an ugly king. He seems to close his jaws with a snap like a steel trap, regardless of all persons, things and principles. But this seems so only to the uninformed. In point of fact he is exquisitely square with his associates, cli­ents and followers. This gives him an army of financial supporters, who would soon enough scatter if they found them­selves losers to his greed or dishonesty. In this way he demonstrates the proposition that honesty is the best policy. He is a natural (and well trained) cap­tain of cap­tains. He selects the ablest and cleverest of associates. He does not seem to take much stock in "wicked partners"; at least he has never been discovered with any of them on his person. His immediate as­sociates are almost invar­iably men of high charac­ter and pleas­ing personal­ity. Mr. Morgan has great physical power. Steam is always up and on. He pays little attention to the ordinary de­fenses which busy men put around them for their own protection. He has time to see anybody who has anything to say worth hearing. He never does anything but listen, think and decide. Like a swift, strong judge he disposes of the motions and arguments of those about him. When he says "no" he says it quietly enough, but somehow the impression is left that he has said it with iron lungs and a megaphone. In dealing with those who make up his syndicates and clientages he carves out his financial pie as an old-fashioned inn­keeper used to stand at the head of the table and carve what Bill Nye called the "common pie of commerce." He seems to say to the hundreds of financial friends about him: "I have adjudicated this matter. I know and have decided what is fair. I have done you good before, I shall do you good some more. You must take what I give you and give thanks. If you think you are not get­ting enough, remember that is what the other fellow thought last time. There are other pies to be cut. Good day." His style is thus like that of the usual God of theology. And so he has power and has done wonderful things in the world of the big round dollar, and if he lives will do more wonderful things than he has ever yet done. Mr. Morgan keeps his business sufficiently at arm's length to be able to leave it and forget it. He is a good rester. He has not become so disordered as to be incapable of repose. He likes the sea and he likes foreign travel and he likes pic­tures and music. He likes jolly friends and good talk. He has not striven for the reputation of being a philanthropist, but there is good ground for the suspicion that his charities in the past decade have not fallen below five millions of dollars. That is a pretty fair pace for an amateur giver. He will probably do better later. The question is often asked, What would happen in the markets if Mr. Morgan were to die suddenly? In my opinion very little would happen, unless his death occurred at a time when general conditions were so bad as to need only a slight excuse to precipitate trouble. So far as Mr. Morgan is concerned, I am of the opinion that he has so arranged affairs that his death would launch nothing on the market and cause no great market support to be withdrawn. He will not want his death to precipitate that which he has striven all his life to prevent. It will not be like him to arrange to have his goodly statue in the market place pulled down and beaten to dust the moment he can no longer send an order to the exchange.